Huntington Beach – With one week left to play, the Sunset League race is far from over. 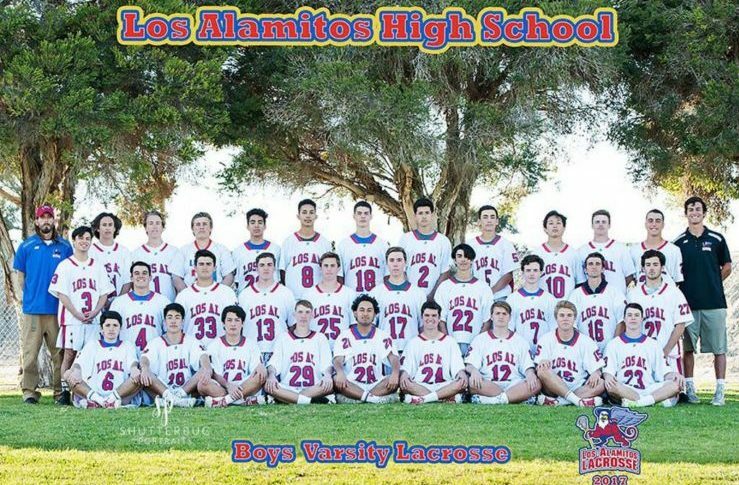 The Los Alamitos boys lacrosse team beat Edison 15-9 on Friday at Edison High School to once again shake up the league standings. Edison, Huntington Beach, and Los Al all could end up with a league championship and the associated automatic playoff bid when the season ends next Saturday. The No. 16 Griffins (10-7, 5-2) are now tied with No. 18 Huntington Beach (8-7, 5-2) for first place in the Sunset League with each team having one league game remaining. No. 11 Edison (10-4, 4-2), with two league games left, fell a 1/2 game behind into second place. The Griffins play Newport Harbor on Friday at Estancia High School while the Oilers play at Edison on Tuesday. “It was a tense, emotional game with a lot at stake. Both teams played hard and battled on the field. Much respect to Edison,” Los Alamitos coach Tim Fox said in an email. The Griffins led 5-3 in the second quarter before Edison tied things up at 5-5. Los Alamitos scored two goals late in the quarter to give Los Alamitos a 7-5 advantage at halftime. In the third quarter, Los Alamitos started heating up, as it scored five consecutive goals to take a 12-5 lead. Edison didn’t go quietly, as it answered with three consecutive goals to make it 12-8 after three quarters. The Griffins put the game out of reach in the fourth quarter, as they extended their lead up to 14-8, eventually finishing off the Chargers. Bronson Ban and Trenton Jones each had four goals for Los Alamitos, with Jones adding three assists. Fox said the Jones played on a different level. “He [Jones] elevated his game and created a lot of opportunities for our offense. I’m proud of our guys for finishing their shots tonight and getting the win,” Fox said. Ethan Campos added three goals for Los Alamitos while Matt Fanelli chipped in two goals. James Sparks and Cash Lopez had one goal apiece while goalie Cullen Murray had 14 saves. For Edison (10-5, 4-2) Connor Grief led the way with four goals, while AJ McLean and Tommy West had two goals apiece. Kenny Carmichael had a goal and an assist while goalie Josh Lightman had 11 saves for the Chargers. With two games remaining (both of which are in league), Edison must beat Huntington Beach on Tuesday in order to keep its league title hopes alive. Edison can clinch the league title outright if they win on Tuesday, beat Marina on Thursday and Los Alamitos loses to Newport Harbor on Friday. For Los Alamitos, they can share the league title with Edison if Edison wins out its last two league games and Los Alamitos beats Newport Harbor on Friday. Los Alamitos can clinch the outright Sunset League title if it wins on Friday and Edison beats Huntington Beach, but loses to Marina. Huntington Beach can clinch at least a share of the Sunset League title if it beats Edison on Tuesday. The Oilers clinch the outright league title if they beat Edison and Los Alamitos loses to Newport Harbor. If Los Al loses to Newport Harbor, HB falls to Edison, and then Edison stumbles against Marina, things get really entertaining with a three-way tie. Edison’s game against Huntington Beach starts at 6:30 p.m. while its game against Marina is slated to start at 4 p.m. Los Alamitos’ game against Newport Harbor starts at 7 p.m.